When I read that there are more than 400 varieties of Swiss cheese, I was astounded. Most non-Swiss people would only know of a handful, the most popular ones being Emmenthal and Gruyère. Still, Gruyère is undoubtedly the big cheese of the Swiss dairy industry, so when we visited the walled city of Gruyères, we of course visited the eponymous factory which is in the AOC Production area. The AOC designation, or Appelation d’Origine Contrôlée, is an official stamp of quality that is reserved only for certain regional products. The label is a guarantee of the authenticity of the products and certifies that traditional methods and know-how are used in their production. Gruyère is a hard cheese with a distinctive texture and flavour. The cheese is mild or ‘doux‘ when its young and when it gets more matured, it develops into a more intense flavour or ‘salé‘. The cows that produce the milk for the AOC Gruyère cheese are fed on natural fodder and special care is taken during the milking process to ensure that a high quality of milk is maintained. The milk is processed quickly in giant copper kettles. The cheese maker adds fermenting agents and natural rennet to cause the milk to curdle. The curds are then cut into grains and the grains and whey are heated to 55ºC for 40 minutes under the watchful eye of the cheese maker. The mixture is then pumped into moulds that retain the grains but allow the whey to drain away. 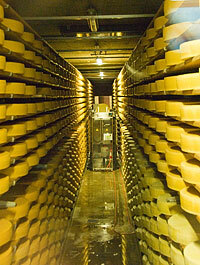 As with everything Swiss, the production of Gruyère AOC cheese is very precise. Each round of cheese is uniquely identified with the aid of a natural casein mark. The round is compresssed using up to 900 kg. pressure and it is turned regularly for a period of at least 20 hours. Following this, the rounds are removed from the moulds and then soaked in salt baths for 24 hours. The next stage is the maturation of the cheese. Before delivering the rounds to the maturing cellars, each round is marked with a branding iron. They are left in the cellar for four and a half months before being tested for quality. Meanwhile the rounds are turned regularly. All Gruyère AOC Swiss cheeses are cave matured with the Classic taking 6 months, Reserve 20 months and the Special Reserve taking more than 14 months. I must say that I’ve neglected Gruyère in the past years, prefering the French cheeses. Having tasted quality Gruyère recently, I’m reminded of the great flavour of this cheese and it’s definitely back in vogue with me again.